The Raurimu Spiral is considered an engineering masterpiece. In 1898, its design cemented the route of the North Island Main Trunk (NIMT) railway through the Central Plateau. Engineer Robert West Holmes’ (1856-1936) design for the Raurimu Spiral provided an inspired solution to the steep descent from just above Raurimu township. Wf class tank engine climbing the Raurimu spiral [circa January 1909]. Alexander Turnbull Library, Wellington, New Zealand. In 1870 plans were put forward to connect Auckland to Wellington via railway. This plan included traversing the Central Plateau. In the 1880s and 1890s surveys were completed to find possible routes through the central North Island where a steep drop in the landscape at the edge of the Central Plateau proved particularly problematic. Holmes was eventually given the task of plotting the NIMT route between National Park and Raurimu because the most recent solution to navigating the descent was too costly. However, Holmes’ subsequent design for the Raurimu Spiral would allow the sudden drop in altitude to take place while maintaining a manageable 1 in 50 gradient (two per cent), and comparatively cheaply. 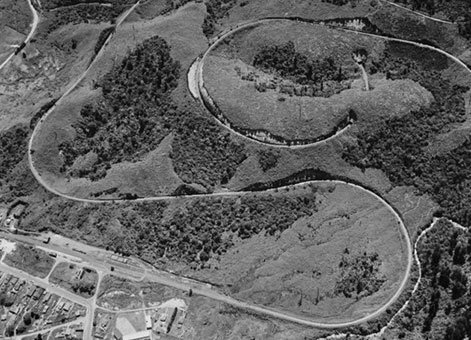 In its descent from the Central Plateau, the Raurimu Spiral consists of two tunnels (385 metres (m) and 96 m each), which allow the track to overlap and wind around in a circle, before exiting through two quarter turns and a horseshoe bend just south of Raurimu Station. Up-and-coming Public Works Department (PWD) engineer, Peter Keller (1880-1961), refined Holmes’ design slightly using the newly instigated PWD policy of transition curves. Raurimu Spiral [24 January 1957], Alexander Turnbull Library, Wellington, New Zealand. Upon completion the NIMT became important to New Zealand’s economic development, and was also socially significant. The Raurimu Spiral is considered a feat of engineering ingenuity and the success of this solution contributed to the on-going effectiveness of the NIMT. Despite advances in technology and materials in the century since its completion, no feasible alternative to the Spiral has been found. Therefore, the Raurimu Spiral is a lasting tribute to Holmes’ engineering achievements and is of considerable engineering heritage importance. 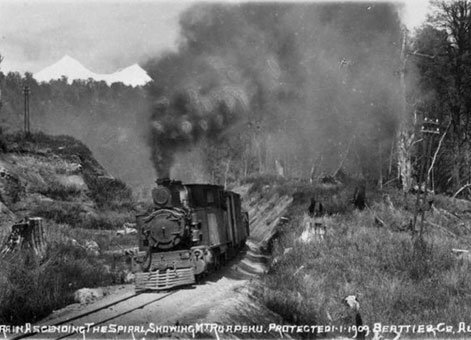 The Raurimu Spiral was added to the IPENZ Engineering Heritage Register on 24 April 2012. IPENZ recognised the engineering heritage value of the Raurimu Spiral with a plaque unveiled February 2009. Close to Raurimu village, 7 kilometres north of National Park on State Highway 4, King Country. At Raurimu village just off State Highway 4 there is a viewing platform.
. Williams, T A, fl 1958: Postcards of New Zealand scenes. Ref: PAColl-5800-54. Alexander Turnbull Library, Wellington, New Zealand.
. Whites Aviation Ltd: Photographs. Ref: WA-42886-F. Alexander Turnbull Library, Wellington, New Zealand. Permission of the Alexander Turnbull Library, Wellington, New Zealand, must be obtained before any re-use of these images.